The Texas sun seemed to be shining on these glowing golden primroses on Garden Bloggers Bloom Day. The garden had hardly any blooms when we left for Texas on May but our return on May 8 was astounding. I am going to give a thorough pictorial record of our May 15 blooms. I’m behind on my spring clean up and weeding so you’ll likely see plenty of weeds. These primroses are increasing nicely. The tall Japanese primroses will be along soon. These are the first irises to bloom in the garden. This white bleeding heart was recently given to me in full bloom. Fortunately it adjusted to its new site comfortably. I don’t remember planting these grape hyacinths last fall. I’m glad I waited for a while before pulling up the first shoots. This geum is a wonderful plant. I love the color of the blooms and it is in bloom for a very long season. It also increases at a slow rate and occasionally sends a baby plant off to the side. These Fairy Bells throw out shoots at the same time as Solomon’s Seal, followed by the yellow bells. The bells will last for a couple of weeks, and the foliage will look handsome all season. These are native to Korea, but they like damp woodlands – which describes their position in the garden. Also called Celandine poppy. It looks very like, only larger, a weed that grows next to my house. More research needed. These plants are growing riotously next to the wood poppies. I thought I was planting Golden Alexanders, but one knowledgeable friend said this was not accurate. Does anyone have any ideas? I planted barren strawberry plants along the top of the stone wall, and in front of the rhododendrons. They have done just what I hope for – covering the ground with a dense mat that does a great job of keeping down the weeds. It will only bloom for a while and the very low foliage looks great all season. I just moved two clumps of Jacob’s ladder out from under the yellow twig dogwood which has achieved an amazing spread. They have adjusted nicely to their place in the sun. Well, a little more sun than they had. Now I have three different Dicentras: white, fringed and Gold Heart. I love them all. Hard to know why these are called Summer Snowflakes when then bloom so early in the spring – but they are later than the snowdrops. The Fothergilla looks great – just like the one on the Bridge of Flowers. Korean Spice bush is famous for its fragrance. 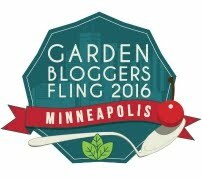 I thank Carol over at May Dreams Gardens for hosting Garden Bloggers Bloom Day. Go on over and see what is in bloom over our great land. Garden Bloggers Bloom Day – June 15-2018 – Roses ! You can grow many things in your garden that need all that water. I have tried several of these here but it just gets too hot and dry here. Love the yellow bells. Happy GBBD. Those primroses are so beautiful. Yellow fairy bells are a plant I haven’t heard of. I do have a solomon’s seal in my shady back yard and would always welcome a new shade plant. Alana – I love those primroses – which I bought at a local independent supermarket. They sell them every year. I never heard of Fairy Bells either, but we have them on the Bridge of Flowers and I got them at the BOF plant sale. Lisa – As you know, I require plants that need water! Sometimes it makes finding a spot for a plant that isn’t so thirsty a challenge. From the photo, I think your mystery golden alexanders may be a type of senecio , common name is ragwort. I enjoy reading your blog, thanks! Eileen – You are right! Thank you so much for the information and thank you for being a reader. I found that the golden ragwort is listed as both a senecio and a Packera, but it is the same plant. It might be a little too vigorous for my garden. Lovely assortment of colors,Do primroses are grown as perennial in your region. Arun – they are definitely perennials. The winters seem to hold no threat for them.